Purpose, the restless yet calculated mind behind the now infamous ‘If the City Had A Voice’ mixtape series, is hardly a new face in the Australian Hip-Hop scene. With the roots of a freestyle/battle rapper, he represented Adelaide successfully nationwide early on, leading him to the US with coveted spot in the Scribble Jam MC tournament at 17. In short, Purpose was a wordsmith before he was legal. 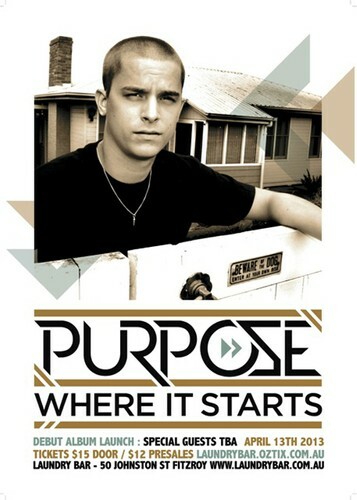 March 1st sees Purpose release his highly anticipated self-produced debut LP ‘Where It Starts’ through MGM. The record, which takes an honest look into the mind of a multi-faceted young man, features singles ‘We Will Be Heard’, ‘Alive’ & ‘Comin Home’ spun on triple j. Everything Purpose has learnt along the way, and then some, will go into the ‘Where It Starts’ tour. South Australia has surely produced some of the biggest names in Hip Hop and Purpose is flying the flag high for the next generation. Purpose plays Laundry Bar in Melbourne on Saturday April 13.